To celebrate Library Lovers' Day, I thought it would be nice to send a notecard to a fellow library lover! 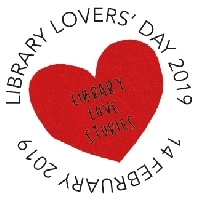 Library Lovers' Day is celebrated on February 14th of each year, so, go and show your Libray some love this Valentine's Day! The card can be storebought or handmade (but, please make sure you're not just slapping some stickers on the card if it is handmade, put some care into making it). Free/Ad/Zazzle Cards (anything along those lines, message me if you are unsure) are allowed, however just make sure that your assigned partner doesn't mind receiving those types of cards. I am making this a Type 3 Swap merely because of some handmade cards being larger/bulkier than normal. Newbie's welcome! Open to swappers with a rating of 3.50 or higher. Please send the card by the deadline and rate when you receive. A heart is up to you! I hope you all have fun with this swap!